It appears they are the lovely, quick moving birds who hop around our yard and take messy baths in the bird bath… I didn’t connect them until I went back with the camera/phone to take the photo of the nest, and they were there momentarily but scared off by my clumsy approach. The male builds the bower and decorates it with blue trinkets to attract the female. Such a beautiful blue, I’d be so tempted to pinch a feather. 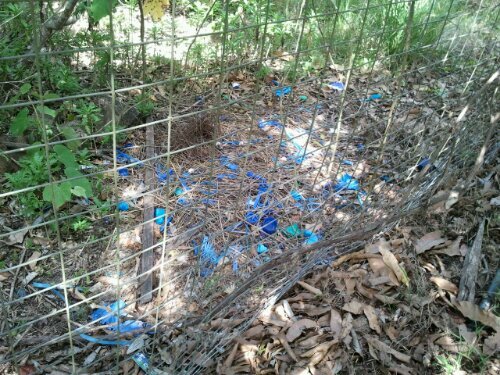 As RS has said, what is a bowerbird? The blue is bits of plastic etc the male collects to impress the female with his nest decorating skills. The male is shiny black & the female a pretty speckled brown. I once saw a BBC nature program where David Attenborough showed bowerbirds building their courting structures. How fortunate for you to be able to actually see the structure. Did you get a chance to see the male? I certainly hope you did. Apparently the nest has been there for years. We only saw it when we went in to the yard next door of the empty house for sale to acquire green mangoes for a friend’s chutney… I did see the male, he is shiny & black whereas the female, who visits our yard quite regularly is a pretty speckled green brown. I have heard of those, but never seen one, I do know they like to collect things. Apparently blue! Yes, these guys have a thing for blue… I’ll keep an eye on my pegs now as I have seen the bowerbirds in our yard but until I saw them at the nest didn’t realise what they were. Of course, they flew away while I was trying to photograph them with the nest. They are never still, so I doubt I’ll get a photo.